Freehold: The Monmouth County Sheriff’s Office thanks the students and staff from the Joseph C. Caruso School in Keansburg for their kindness and generosity. 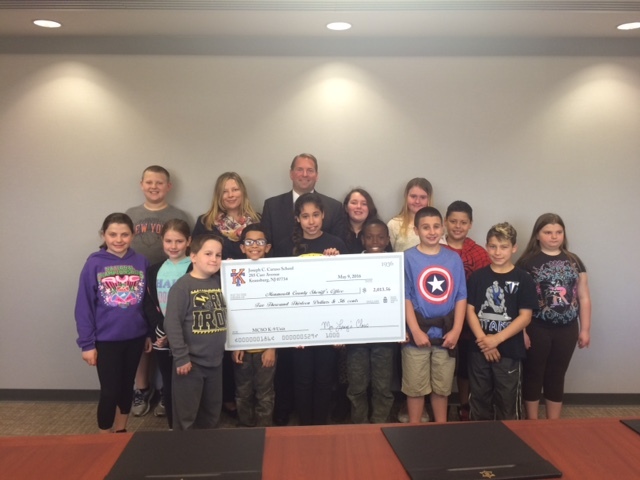 On Monday, May 9, fourth graders visited the Monmouth County Sheriff’s Office Public Safety Center and presented a check for $2,013.56. 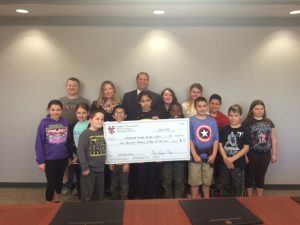 A large portion of the funds came after students raised money as part of their fourth grade project headed by their teacher Barbara Leary. They opened up a store in the school called the Dollar Dog and sold items that were donated from local businesses, staff and residents. The rest came from fundraisers through local restaurants and free gift wrapping days at Boscov’s Department store at the Monmouth Mall. “We take pride in participating in this project,” said Barbara Leary. “The Monmouth County Sheriff’s Office K-9 Unit has conducted presentations and demos at our school. The Monmouth County Sheriff’s Office K-9 unit presently consists of 6 handlers and 7 K-9s with 1 team in training. The Unit includes 2 explosive/patrol teams, 2 narcotics patrol teams, 1 explosive teams, 1 tracking team and 1 narcotics team. They are called upon year-round to assist local police departments with narcotics detection, explosive detection and criminal or missing person searches. In 2015 the K-9 unit responded to 109 explosive calls, 212 tracking calls and 256 narcotics calls. They presented a total of 147 K-9 demos.